Today, the Sacramento Kings and Bogle Vineyards & Winery announced the release of their specially crafted “Proud Roots” 2016 vintage wine.Proud Roots will be exclusively available at various beverage stands and premium spaces throughout Golden 1 Center and the Bogle Family’s Tasting Room in Clarksburg starting on February 2. Made from grapes harvested in 2016, the inaugural year of Golden 1 Center, the Proud Roots blend celebrates the arena and Sacramento region’s prominent agricultural ties and Farm-to-Fork movement. Proud Roots is sustainably-certified by the California Rules for Sustainable Winegrowing for adhering to stringent eco-friendly growing and winemaking practices. The Certified Green seal, given only to wines which meet key sustainability requirements, is featured prominently on the back of the bottle to showcase these efforts. This wine offers guests and fans the opportunity to enjoy complex flavors of blueberries, blackberries, clove and cream soda – complete with a full-bodied finish. This special edition wine features Bogle’s brawny Clarksburg Petite Sirah blended with a touch of a plush Malbec variety. The 2016 Proud Roots red wine is a celebration of the partnership between the Kings and Bogle as both share a commitment to community, sustainability quality and excellence. The grapes of the wine, harvested from Bogle’s Sanchez Ranch, nestled against the Sacramento River, are consistent with the Kings sustainability and sourcing charter, sourcing 90 percent of food within 150 miles of the arena. Located in Clarksburg, California – just 15 miles from Golden 1 Center, Bogle Vineyards & Winery is a family-owned and operated winery that serves as a leader in green practices, producing high-quality wines. In 2018, Bogle was awarded the Green Medal Award: Leadership for the winery’s stewardship in the vineyard, using innovative farming practices and implementing sustainable business standards. Golden 1 Center sets a new standard for excellence as the world’s most technologically advanced and sustainable arena. 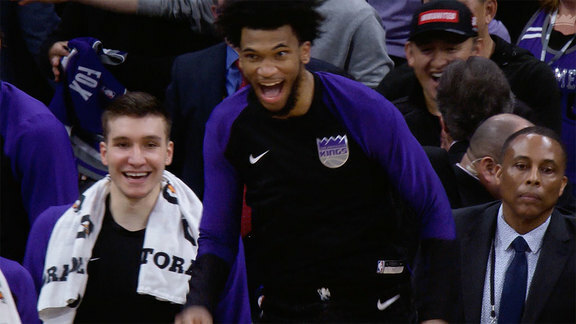 Awarded Environmental Innovator of the Year by Green Sports Alliance and Sustainable Business of the Year for Energy Conservation by BERC, the Sacramento Kings have redefined the sustainable capabilities of sports teams with Golden 1 Center being the first arena awarded LEED platinum designation and the most innovative food program in sports.